My high school friend is back in town, and I wanted to make her daughter something. 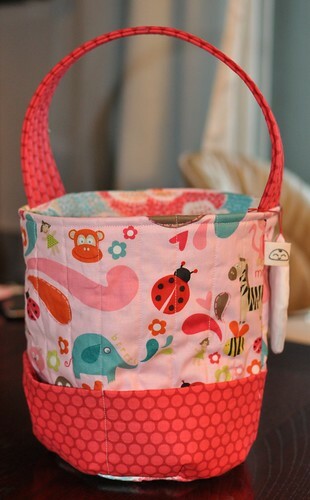 I tried to make a quilt but couldn’t finish it in time, so made a toy bucket (from this tutorial) instead. Voila! The pockets on the side are so cute! And this fabric is way cute. Im sure she will love it more than the quilt! A toy bucket sounds so much more fun than sleeping time? Five hours sounds like a long time!